A blood donation clinic in Saskatoon was over capacity after the incident. 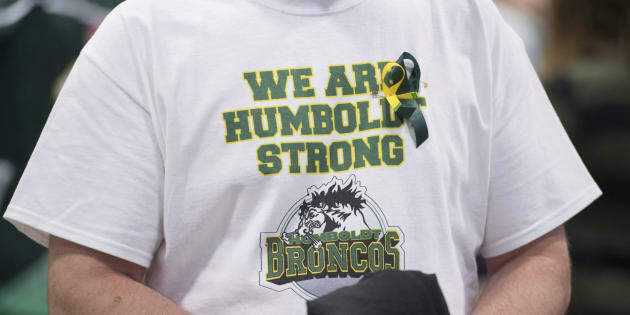 A man wears a Humboldt Broncos shirt during a vigil at the Elgar Petersen Arena, home of the Humboldt Broncos, to honour the victims of a fatal bus accident in Humboldt, Sask. on April 8, 2018. UPDATE- April 11, 2018: Humboldt Broncos athletic therapist Dayna Brons died of her injuries in hospital, 5 days after the bus crash. She is the 16th fatality in the accident. Canadians hoping to help with the aftermath of Friday's deadly bus crash in Saskatchewan weren't just willing to support families and victims with money, they were eager to give blood, too. So much so, in fact, that the Canadian Blood Services' clinic in Saskatoon was over capacity on Saturday, according to CTV News. "We saw 150 come in [on Saturday]. Normally we'd see about 80, so there's been a huge response today of people coming out wanting to help," the branch's manager, Mike Fisher, told the broadcaster. Our thoughts are all with the community of Humboldt and anyone affected by the horrible tragedy last night. We have already began to see an overwhelming response all over Saskatchewan of people wanting to help. To donate visit https://t.co/7SpDQ6GKN5 or call 1-888-2donate. The crash in Humboldt, Sask. took the lives of 15 people from the Humboldt Broncos junior hockey team. Fourteen others were injured. The incident occurred after the team's bus collided with a tractor-trailer, according to the RCMP. Officials are still investigating the cause of the crash. Some donors at the clinic waited two hours to help, according to Global News. My mom volunteers at Canadian Blood Services in Saskatoon. She is there this morning and says so many people have come out to donate. We all want to help in this tragedy. The country is grieving with the Humboldt Broncos. Shortly after the crash's victims were identified, the outpouring of grief was met with a flood of donations. A GoFundMe campaign set up to help them and their families received more than 70,000 donations and, as of Monday morning, has raised more than $4.8 million. The incident has made headlines worldwide, with both U.S. President Donald Trump and Queen Elizabeth II issuing statements to offer their condolences. On Sunday night, hundreds gathered at a vigil at the Elgar Petersen Arena, the team's home, to pay their respects to the 15 people who were killed. "Today and for every day forward we are all Humboldt Broncos and we will be forever Humboldt Broncos strong," Kevin Garinger, the team's president, told those in attendance.